Update: the 7a-10a debut telecast of Get Up! averaged 283,000 viewers per minute. That’s down 13 percent from the 327,000 the 7-10a SportsCenters averaged the same day a year ago. First Take averaged 417,000, up from 400,000 a year ago. I’m team: “Disappointing? Sure. Disastrous? Nah.” But it’s possible I’m the only member of that team who isn’t employed by ESPN. Sources tell me “Get Up!” debuted to a 0.28 overnight rating. Up slightly from the 0.26 that the same ESPN time period drew last year. A rerun on ESPN2 added another .10 overnight. That ESPN2 time period last year drew a 0.13 so technically across both windows, and both networks, it’s down a smidge from last year. While these ratings are in line with my expectations there is an aspect to this morning that does surprise me and pleasantly so: nobody seems in a very big hurry to crap all over those ratings. I’m posting this only because I haven’t seen anyone else post them yet. Not sure if this is some kind of “Peace in the Jimmy Pitaro era” thing and nobody really cares or if folks are just tired from staying up late watching basketball. FWIW, Undisputed was flat week over week with a .17 overnight rating, so while it doesn’t look like Get Up! hurt Undisputed, last Monday was a lesser sports Monday than yesterday because there was a major championship on last night, so all other things being equal, Undisputed probably would’ve been up a little week over week. But a year ago Monday Undisputed only drew 0.09 overnight, so it’s up nearly 100% versus last year. Anything with it as a lead-in for First Take’s ratings? Or SportsCenter on ESPN2 compared to Golic/Wingo? Nope, not yet and will probably have to wait for viewership this afternoon (and maybe longer in case of the Golic/Wingo simulcast on ENN). But agree it will be interesting to see whether Get Up! 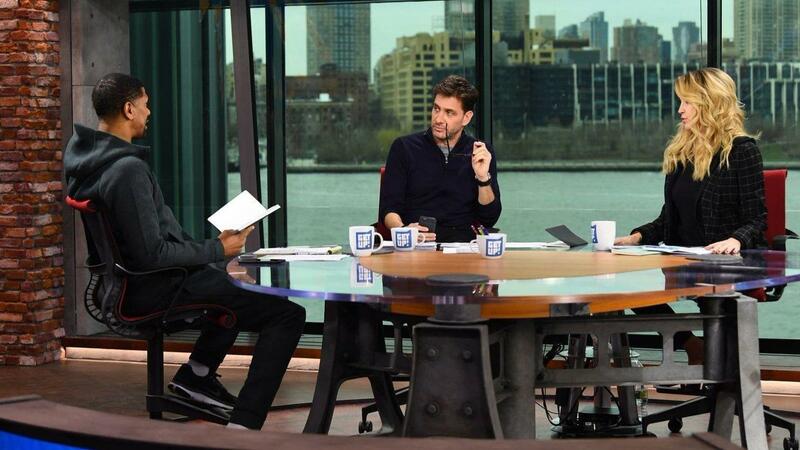 is a better lead-in for First Take. I want to see rebroadcast of Golic and Wingo [I live in the West} or will choose other network shows. One of the dumber moves ESPN has ever made breaking up mike and mike. Get Up is horrible. Still watch Golic and Wingo but it’s not as good as it was. They should have Jason Fitz on more instead of Wingo. He’s good.